What should you know about proper aftercare following surgery on a cat bite injury? What has to be done in a case like that? The suppuration sources (see image) always have to rigorously be removed, this is true for the primary surgery but also in case a revision surgery becomes necessary. Is hospitalization mandatory with surgery on cat bite injuries? What could be the consequences of a cat bite injury? What is the procedure in these cases? How does an infected bite wound affect mobility? Is a mobility malfunction reversible? What results may be expected from revision surgery? The biggest danger following surgery on a cat bite injury is the one of the recurring infection. Should there be signs of a recurring infection, it is very important to immediately proceed to surgery once again. It is imperative to surgically remove all new suppuration by eliminating necrotic or severely ischemic tissue in order to deprive the infection of any “growth medium”. This has to be determined on a case-by-case basis. Severe infections require constant monitoring, frequent changes of dressing and many times also intravenously administered antibiotics (via infusions). Obviously such measures are best provided through inpatient care. Very severe cases in particular to the back of the hand typically are associated with substantial dying-off of skin and fatty tissue cells. Such soft tissue defects are challenging as they may lead to the exposure of tendons or bones. The exposed tendons seen here represent a challenge even after the infection receded, as there will be a need for a very complex revision surgery to occlude the extensive soft tissue defect. As long as tendons, bones or joints do not lay exposed, the defect may be restored through a skin graft (split skin graft). If, however, tendons, bones or joints do lay exposed, the aftercare will require complex skin flap transplants including their respective blood vessels. These interventions are rather complex and are mostly carried out by specialized departments. An infection that follows a bite wound bears a very tangible risk to retain a severe mobility malfunction of the fingers. The application of the dressing may already be an efficient way to prevent these mobility malfunctions. Special dressings should be used, which will allow proper mobility to the fingers (as far as the infection will allow for it). Severe soft tissue infections as a consequence of a cat or dog bite injury often come with mobility malfunctions. These malfunctions are mainly triggered by extensive adhesions within the flexor or extensor tendons or even the articular capsule. Mobility malfunctions compromising the functionality of a hand are known to be a frequent long-term effect of bite wounds. It is very important to immediately start physiotherapeutic or ergo therapeutic measures just as soon as it becomes evident that a mobility malfunction may persists in order to reduce the severity of the condition. Once the mobility malfunction has established itself, revision surgery may be beneficial. Damages through bite injuries oftentimes are not limited to tendons, bones and joints. 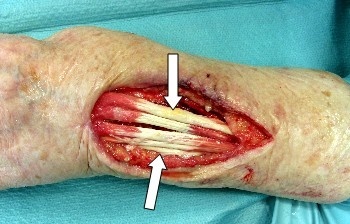 Many times it also involves the tissue through which the tendons glide. It may also get damaged through the actual bite or the infection resulting thereof. Releasing tendon adhesions at a later time does usually not allow for full restoration of damaged tendon sheath synovial membrane tissue. Therefore a subsequent surgical intervention performed on the tendons (tenolysis) may lead to an improved mobility, but not to full mobility restoration.